While new patents and inventions appear all the time, they don’t often aim at a mainstay, like the common wheel, which has had the same design for thousands of years. Many inventors have focused on how a wheel connects to a vehicle through different suspension systems. An Israeli startup has infused the suspension right into the wheel itself, with a selective shock absorption system. Dubbed “SoftWheel,” the concept was imagined by Israeli farmer Gilad Wolf when, a few years ago, he broke his pelvis and was confined to a wheelchair. “Sitting on one of the more sturdy wheelchairs, having to manoeuvre around his fields, Gilad decided to design an improved model with suspension,” said Ronny Winshtein co-founder, inventor and former chief executive officer of SoftWheel. Wolf partnered with some colleagues and an Israeli nonprofit organization for rehabilitation technologies called Milbat and, together, they approached Tel Aviv-based Rad-Biomed Accelerator to assist in funding and developing the project. “Rad-Biomed CEO David Zigdon liked the idea but decided to come up with a product that would be disruptive in technology and market orientation,” said Winshtein. With Winshtein, they decided they would put the suspension in the wheel and make it selective – i.e., to work only at high-magnitude shocks – otherwise, the wheel would remain purely round and concentric, functioning like any other wheel. In 2011, SoftWheel was founded with this notion in mind, and it attracted some of the best and brightest players in Israel to the wheel business. One of them, Ziv-Av Engineering, assisted them in developing the wheel’s unique mechanism. The company has filed several different patent applications for utility and design that they are confident will provide broad protection to their inventions. Barel acknowledged it is difficult to reconsider one of the oldest possible technologies ever invented, but also exciting. “We’re currently focused, first and foremost, on the market, with a first product for active wheelchair users … in the very near future,” said Barel. 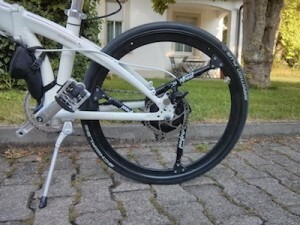 “We also made substantial progress in designing similar wheels for commuter bicycles, some of which also include a motor in the wheel hub.” The prototype is featured in the video below. “We also develop concepts for other types of vehicles based on our know-how and technology, and have been in discussion with some very interesting players in Israel and abroad,” he added. The company is very proud to be part of the Israeli startup Kaleidoscope. Winshtein believes that it is not by chance that so many innovative technologies have originated in Israel. He said it is embedded in the culture, the atmosphere, jokingly adding, “Probably, also [the] heat and humidity, but mostly the openness, from any level, to try and change the world for the better. One of the other companies that has shown interest is an aircraft landing gear manufacturer. Another focus for SoftWheel has been implementing the technology on city bikes, as more and more cities introduce bikes that anyone can pick up and return at different locations (for a cost). “As the wheels reduce the impact of typical street blows, both wheelchairs and bikes that use them can move around freely without having to access ramps,” said Barel. “The suspension systems currently available in city bikes are unsuitable for such obstacles and often result in the rider taking the impact. Eventually, the product will sell itself and, in doing so, it has to answer real needs for real individuals.